The previous weekend (not the one just gone) was a cold one: the kind where you curl up under blankets and read and eat too much. Even in Southern California. The kind where you're congested from the heating and tired because a good night's sleep is interrupted. The week before was a week where I dutifully wrote down a handful of gifts. I couldn't see the gifts God gave me. My world was blah. It got darker. Something rather unpleasant happened. The little black cloud over my head threatened a downpour. I read a blog post about finding still points in my day and the world suddenly turned upside down. 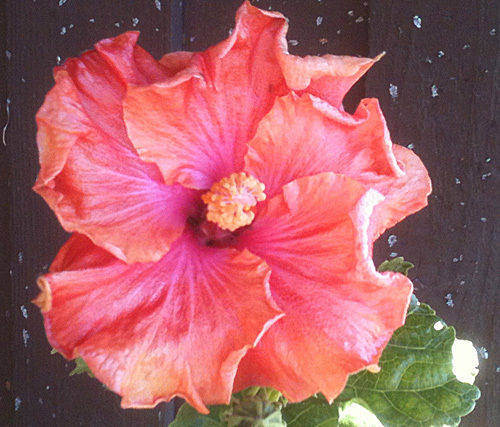 I remembered my astonishment that our tropical hibiscus is flowering in the midst of a cold snap. I recalled the beauty of watching Russian Caravan tea leaves meander to the bottom of the clear teapot. The little black cloud dried up and vanished. I felt God nudge me, remind me and say: "see? You don't need to concentrate so hard on looking for me. I am everywhere." I wrote the above at the beginning of last week. Now, I am at the beginning of a new week and I see I woke up to God's gifts and blessings at just the right time. This past Sunday was also Christian Unity Week. The Newman Center Catholic Community shares our church space and our choirs are getting together more and more frequently. So we had a pulpit exchange and the choirs came together. We sang a lot of spiritual, gospel tunes, or not-quite-gospel but similar rhythm. As we rehearsed and then sang during two services, I felt God with me and I affirming God's existence and God's love for me, and that no matter what happens, God loves me and I love God. 48. the kindness of the bus driver who didn't make me pay extra for a bus pass when my electronic one failed.